Like a glass of tangy orange juice on a slow morning or a pop song at the Royal Albert Hall, the Ham Yard Hotel’s charm lies in just how vibrant and offbeat it can get. 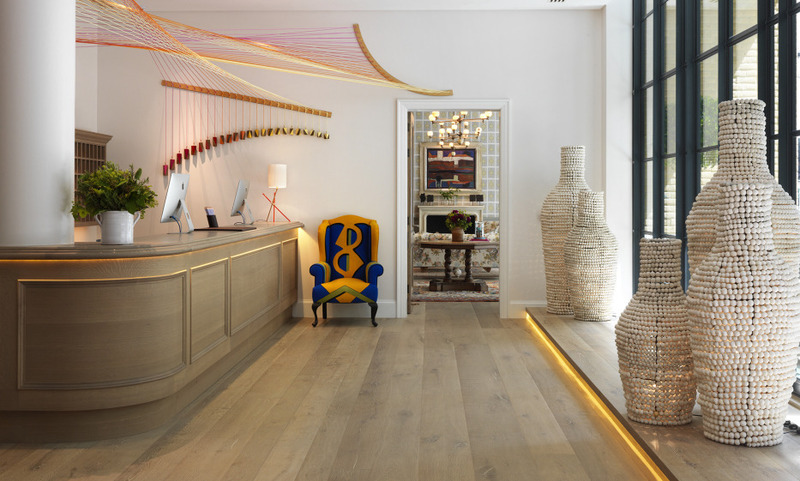 For years now, the Firmdale hotels have been on a quest to break the code of what a “good little London hotel” ought to be, and their latest may be the most subversive of the lot. For one, it’s found in a miniature village at the heart of Soho complete with designer stores, a Japanese restaurant, a store packed with rare organic teas... and an authentic 1960’s bowling alley flown straight from Texas. Inside is just as surprising, with an eclectic mix of colors across all the common areas and rooms which, by all rights, have no right to go so well together. If different and exclusive are on the agenda, none do it better than the Ham Yard. Great location as the hotel is in the heart of theatreland and is surrounded by Soho's edgy bars, cafes and shops. Do not miss the buzzing Ham Yard Restaurant and Bar with outdoor dining. Great mix with private event rooms, a theatre and a 1950's style bowling alley. Fantastic service, great atmosphere and very nice friendly staff. Excellent decoration and cleanliness in all areas. Excellent hotel and would recommend to friends. Amazing design. Breakfast fantastic. Room stunning. Excellent. As a seasoned business traveller, staying in the best hotels in more than 40 countries over the years, it was amazing to find The Ham Yard on my doorstep in London. One of the best hotel experiences i can remember: beautifully designed and interesting contemporary decor throughout the hotel, each of the rooms is unique, plenty of lighting, excellently laid out and offered good space, incredible service to boot: just loved it. Wonderful hotel. Decor and finish outstanding. Terrific, helpful staff. One of the best hotels we have ever stayed in. Fantastic in every category. Extra special to have a roof terrace in the heart of the city. The hotel is an oasis of calm and style. For a new building the owners have cleverly captured an old world feel and we were very impressed by the decor. Ham Yard stands out as one of the best if not the best hotels I've stayed. I plan to stay there again on my next London trip. The staff was exceptional. The décor was lovely. We enjoyed the style &amp; art pieces very much. Loved both the bowling alley and the roof deck; both are excellent amenities which added much to our stay. Finally, the Ham Yard staff was a pleasure. Thank you. Love the private drawing room and library for residents only! Absolutely essential in the afternoon as the whole of the bar area is full. We were so happy to spend time at the Ham Yard. It made our stay in London unforgettable. The hotel was terrific. The staff were knowledgeable and friendly. The restaurant was excellent. The location was perfect. An excellent hotel where we had previously stayed. Its location is perfect and even if it’s hard to access it (very narrow street). The decor and atmosphere are perfect and the size and comfort of the rooms make for good value. The interior designer deserves a Nobel prize! The hotel is a very good choice in London. Great position, efficient service, professional staff. everything was perfect: the room upgrade , the complimentary breakfast and the welcome drink. Preferred place to stay in West End. Great location, fine accommodation and quiet when all around is full of noise. A fabulous hotel with, great people, very attentive to all of our desires and quirks, it was an absolute treat, they were are all very reactive and efficient ! My only issue, was the absence of a &quot;courtesy kit&quot; in the bathroom and no personalized slippers in the name of the hotel … That was a bit of a shame. However providing a child size bathrobe for my son ... that’s a 10/10. Dear Sir/ Madam, We have the opportunity of staying at your hotel Ham Yard for the first time although we have been travelling to London very often since very long ago. Being both, my wife and I, very experienced travellers at a rather very high status we found the staying experience with you excellent and much better than many of your well known competitors in which we have stayed. Areas of differentiation and on our opinion superiority include but not limited: The Physical environment of the Hotel including spacious room (we have stayed at 214), modern decoration of common areas, light colours used , tapiceries , odours used for bed linen etc. The capabilities and the attitude of the staff we have experienced. Young people however very well trained and “naturals” in what they were offering. Very capable of suggesting alternatives, very efficient in serving the excellently produced food, knowing the different dishes and commented upon the taste (experience from lunch at the restaurant at 15.00), authorised even to change the New Zealand' rose wine to the French one just of the sign of my wife’s disappointment and without even her asking for that. And all the above with the maximum proficiency and the best of their smile. Finally, offering a personalised service by knowing our names and making this “ personal” touch without however going beyond the “ intrusion” point (it was very good that when my wife entered the lobby looking for me she was informed immediately and even before asking that I was in the Library) I felt obliged to list some of those many “small” things that make this hotel a really unique experience for us. I feel that the management, the staff, the training, the recruitment, the spirit, the appearance form together a second to none Hotel for the experienced customer that wants to be pampered as at home. Congratulations to the manager and the staff. We will definitely come back very soon. Very nice hotel, really central but quiet! It is very easy to get around in London from Piccadilly to Purd! All the bars, restaurants and the theaters are around the corner! I travelled around the world &amp; always stay at 5 star hotels. A lot don't deserve the rating, the Ham Yard hotel scores 10 out of ten on every level for me. Praise indeed as I am very demanding. I really liked the hotel and the kindness of all the staff, with a special mention to the concierge, the waiting staff at the bar and the young lady in charge of the breakfast menu. I would really like to renew the experience. A superb hotel which is impeccably designed, decorated and situated in a very central location. Beautiful décor, fabulously comfortable beds and a wonderful place to stay. The only downside that we can think of would be, that staying at the Ham Yard makes staying anywhere else almost impossible!!!!! Absolutely incredible hotel. Nothing to say against it, everything was perfect from the welcome at reception, to the bar and the restaurant. This is a super hotel. Unfortunately sleep evaded us due to the horrendous street noise. More insulation is needed. We received a free breakfast and cocktails. We would revisit Ham Yard in a heartbeat but definitely not the rooms we were allocated due to the noise levels. The best hotel I have stayed in with the possible exception of the Cafe Royal Hotel. I will stay here again. This hotel is great, its decoration, its comfort, its modern look, its location corresponded to us perfectly. This was the hotel we were waiting for in London! No doubt we will go back there the next time. Ham Yard Hotel was one of the best hotels I've stayed at in London. Beautiful Hotel and excellent fun staff. Perfect stay with my son. They made it very special for both of us. Really nice hotel with a boutique ambience. The restaurant served the starter before the wine was brought to the table and bread rolls were not offered.The bar was a bit packed when we arrived in the evening ,so nowhere to sit. But overall I would still recommend this hotel and would be happy to stay there again.